Cuff inflates and deflates with the push of a button. 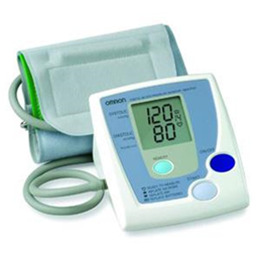 Large LCD digital panel displays blood pressure and pulse; 14 reading memory recall. Easy-to-apply D-ring standard cuff. Uses 4 AA batteries (not included); compatible with AC adapter. 2-year manufacturer defect warranty. Arm Circumference: 9 - 13"